We like to start young children when they are “dry”, and when they have sufficient attention span to allow them to concentrate during a lesson. The early classes are “music and movement” and we work to improve your child’s co-ordination and muscle strength. Normally this is at about two and half years, but it can vary from child to child. Does my child need a uniform straight away? No, it is best to see if your child settles in the school before buying any uniform. 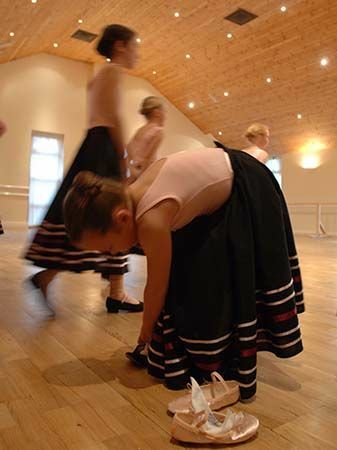 Initially you need a stout pair of shoes for Tap, and bare feet for ballet (young children only). It is best that they wear something light and does not restrict them, for example jogging pants and a loose fitting top. Can I stay with my child during lessons? For very young children who are a little apprehensive about the unfamiliar surroundings, it is usually better to have mum or dad within eye shot of their child. Usually after a week or two, your child will be settled in the class, and it is then probably better that the parent is not in the room during lessons, as they can act as a distraction to the child. We have a large reception room within the studio complex, so you can quickly be called in the unlikely event that your child shows any distress, otherwise you can relax and read a magazine. When can I watch my child's progress? We have a watching week during the first week of every month where all parents are welcome to come and see how their child is progressing. We try and keep the number of parent’s and family members who can attend down to a maximum of 2, as the studio can get crowded and distract the students. During show rehearsals we do not allow any watching, this ensure that the shows come as a nice surprise when you first see them for real! Is there somewhere for my child to get changed? Yes, we have a large changing room with changing cubicles, behind the reception room. So your child can get prepared in privacy. We also have an area with toys to keep the younger students or their brothers and sisters entertained whilst they are at the studio. Are all the staff cleared to work with Children? Why does my child need her hair in a bun during classes? We have made a few near misses recently where students have either had their hair tied back in a pony tail or not tied back at all, and have either caught themselves in the eye or other students when performing turning movements. Therefore, due to these Health and Safety concerns I must ask all parents and students to ensure their hair is back in a bun before class. It does not need to be of exam standard, but twisted and secured with sufficient grips and scrunches. Long fringes should be secured with grips so that they do not also get in to the eyes. Can my child wear jewelry during classes? We recommend that only stud earrings are worn during lessons. Larger or drop earrings can easily get caught and cause injury to your child. We also do not allow bracelets and necklaces to be worn during classes as they can also pose a hazard during classes. Any rings should be small and have no sharp edges which could catch other students. If my child has an emergency, how will you contact me? We ask all parents to complete a school charter form which gives details of what we provide to your child and what we expect from you and your child. We also use this to give emergency contact details and other important information. Why is it important for my child to warm up before a lesson? A good warm up is important for all but the youngest students. Dancing is a strenuous activity that can easily damage muscles. Cold muscles are much more likely to tear or strain. A good warm up which stretches and warms the muscles is the best way of preventing this type of injury. Can we take photographs and videos of our child during classes? Prior to allowing you to take photographs or videos during a class, we must seek permission of all the other parent’s who’s children are present. How do we pay for the first few weeks? For the first few weeks you can pay weekly at the lessons, but at the end of each month you will be given a bill to cover the lessons for the following month. The bills are due the first Saturday of the month and should be settled as soon as possible, preferably in cash, any cheques should be made payable to Christine Raynor Academy of Dance with your cheque guarantee card details clearly written on the reverse together with your address , we do not currently accept credit cards. If any bills are outstanding by the 21st of the month, they may be liable for late fees. Do I pay when my Child is absent? Yes, unless your child has a doctor’s note or is in hospital then you will need to pay for missed lessons. The payment maintains your child’s place in the class, also we still have the overheads of room rental and staff wages, even if your child misses the class. What am I expected to pay for my child if they are in a show? When we get close to a show, we will give you detailed information on how we keep any costume costs to an absolute minimum. Our approach is to use the buying power of all the parents combined to purchase material and other costume items at wholesale prices. Where do we get the uniform? Miss Susan is able to supply most he uniform at competitive rates. She is present at the school on most Saturdays. Please see the uniform page for more details on what is required. What type of heel should have on my tap shoes? A low heel, not a Cuban heel. Either ribbons or laces can be used. Where can I get a character skirt? They can be ordered form good dancewear shops, but most students get them from Dorothy. If you need her details then come and ask Miss Susan or myself. Details of the ribbon layout can be found on the uniform page. Do ballet shoes need elastic over the instep? Yes, it important that the ballet shoe is secure on your child’s foot. If there is no securing elastic there is a possibility that the shoe will work loose and may twist your child’s ankle. Where can I get pointe shoes? It is extremely important that pointe shoes are fitted correctly. There are many manufacturers and you will normally need to try a number before you find the one which suits your foot. The most important thing is that they shou ld be fitted by an expert to ensure that you get the correct show for your child. You can also expect your pointe shoe requirements to change as your feet get stronger and change shape. We would not recommend you order pointe shoes off the internet, unless you are an experienced dancer or you are absolutely sure the shoes will fit. Please see our display in the studio outside studio 2 for more information.